ITCG Fermi was founded in 1959 as a technical school for Accountants. In 1991/92 a course for Surveyors was introduced, and then, in the following years, a course for Computer Programmers, a course of for Marketing and a Tourism course were added. In 2013 a course for Farming was introduced. The school has always been ready to widen its scope by meeting the needs of students, parents and the local companies and authorities, and has been growing, with student numbers increasing from 750 in 2007 to 1300 in 2015. ITCG Fermi has always been ready to promote training opportunities for staff and students, both on a local and on international level. The school has carried out several Comenius projects, international mobility projects financed by the Region Tuscany, internship programmes and entrepreneurship projects for 11th and 12th grade students. For such activities, the school collaborates directly with local companies and Entrepreneurs Associations, in order to meet the needs for innovation and change in the current economic situation. To promote language learning, every year the school organises preparation courses for the most common international certifications such as PET and FCE for English, DELE for Spanish and DELF for French, aimed at both students and teachers. In addition to that, the school has been an ECDL preparation and test centre for many years. The Eucip Core certification, aimed at the students in the programmers’ course, has recently been introduced thanks to the support of both AICA and the Italian Ministry for Education. In 1998 the ITCG Fermi training agency was established, which has been credited ISO 9000/2008 by the Region Tuscany since 2004, and Effective CAF User since 2011. In the perspective of a further improvement of organisational and educational quality, ITCG Fermi has introduced self-assessment according to the CAF framework since 2009/10 and obtained the ECU label (External CAF User) European certification in 2011 and 2013. In the school year 2012-2013 ITCG Fermi was one of the 11 schools in Tuscany to be selected for taking part in the Giovanisì Lab/Scuola Project, promoted by the Region Tuscany and aimed at facilitating the access of young people to the different measures of the Giovanisì Project (dealing with youth autonomy and career opportunities). In 2013-14 year ITCG Fermi was selected to take part in the consultancy and placement project called Fixo S&U, promoted by the Ministry of Labor and Social Policy, and consisting in an assisted path towards a university or a job career. The activities started within the FIXO project are still run regularly with the 12th and 13th form students. In 2014 ITCG Fermi started an Erasmus Plus KA1 Vet Learners project for 50 students in the tourism section to carry our a 30-day internship abroad. The first 40 students have already done their traineeship in Malta, in the UK, Spain and France. The school is located in Pontedera, a small industrial town in the province of Pisa, with a population of about 26000 inhabitants. The worldwide famous Piaggio industries, whose most famous product is the “Vespa” motor-bike, are based in Pontedera. As a high share of the production process has been delocalised abroad in order to benefit from lower labour costs, the economy has been declining in the latest years. Many pupils come from nearby villages and surrounding rural areas. The students do not often get the chance to travel or get in touch with different countries and cultures, except for the opportunities given them by the school. ITCG Fermi has been carrying out student traineeships, student entrepreneurship projects and international projects for many years. 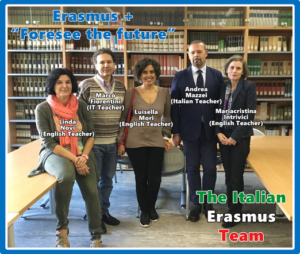 The school had carried out 10 Comenius projects (both bilateral and multilateral ones), three Comenius Individual Pupil mobility projects, and six international mobility projects funded by the Region Tuscany. At the moment the school has an Erasmus Plus KA1 Vet Learners project involving 50 students from the tourism section in a 30-day internship abroad. ITCG Fermi has had a commission dealing with planning and organizing international projects since 2009, and a “Funzione Strumentale” in charge of coordinating international projects and promoting the study of foreign languages, while monitoring and assessing the activities carried out, since 2001. Ms Mori, who is the above mentioned Funzione Strumentale, is also an eTwinning ambassador for the Region Tuscany.